The U.S. labor market data released last week on Friday showed that the U.S. unemployment rate held firm at 3.7%, marking a 49-year low. The U.S. economy added 250k jobs during October beating estimates of 194k jobs. However, the jobs for September were revised lower to 118k. Wage growth in the U.S. rose 3.1% on the year in October marking the most significant increase. Meanwhile, Canada’s unemployment data was also released. The official data showed that Canada’s unemployment rate fell unexpectedly to 5.8%. However, the employment change rose just 11.2k which was below estimates of 12.7k. The markets are looking to a quiet open today. The European trading session is expected to see only the release of Spain's unemployment change and the Eurozone Sentix investor confidence report. In the UK, the services PMI report from Markit will be out. Economists polled forecast that the services sector could fall to 53.4 after registering 53.9 in the month before. The NY trading session will see Markit's final services PMI coming out followed by the ISM non-manufacturing PMI. Estimates put non-manufacturing activity index to ease to 59.3 from 61.6 in September. EURUSD (1.1384): The euro currency managed to rebound to the upside, but price action was stuck within the resistance level that was previously established. A quick reversal was therefore seen at 1.1435 - 1.1462 region. 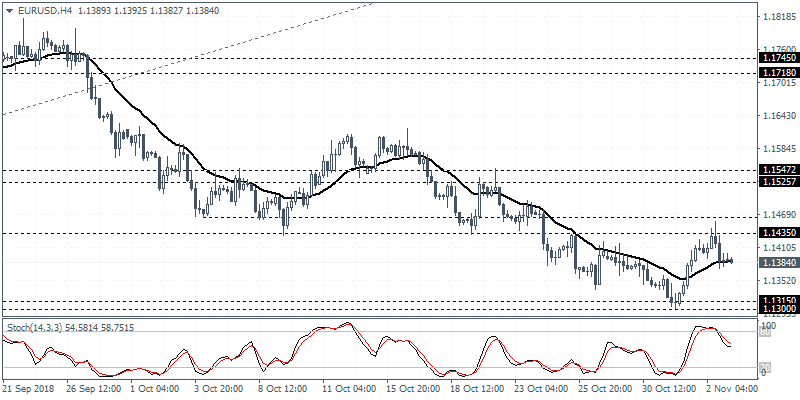 The EURUSD remains trading flat within the resistance level and the lower support level formed at 1.1315 - 1.1300. A breakout from this range is required for the currency pair to mark the next direction in the trend potentially. Further losses could be expected if the EURUSD falls below the support level. GBPUSD (1.2984): The GBPUSD currency pair maintained strong gains, but Friday's price action saw the cable taking a breather. 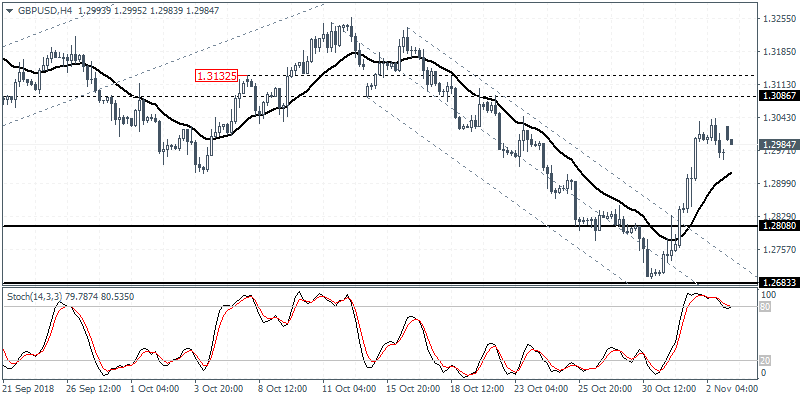 Price action was subdued as the GBPUSD retraced some of the gains from earlier in the week. The resistance level at 1.3087 remains a key level of interest. To the downside, support at 1.2808 is quite likely to hold out as support. If GBPUSD falls below 1.2808, then we expect to see a test of the lower support at 1.2683 level. 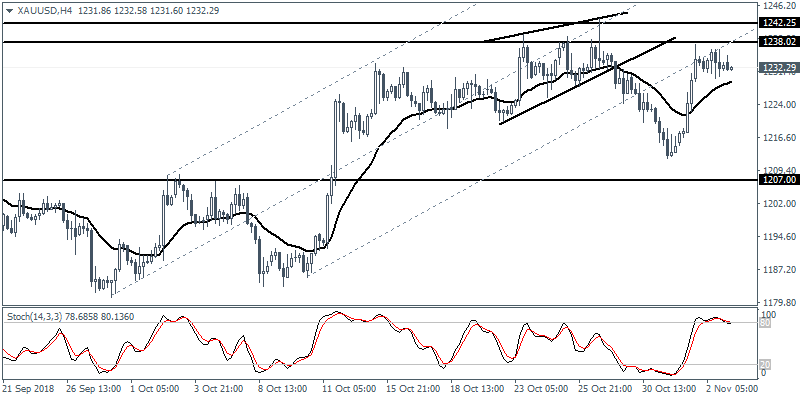 XAUUSD (1232.29): Gold prices were seen mostly consolidating near the highs established on Thursday. Price action is trading below the previously established resistance level of 1238.02 region. As long as this resistance level holds, gold prices could remain trading subdued. Failure to retest the lower support at 1207 remains a key point of interest as a decline in the precious metal could see this level being tested.